Gazeta Press – Cover of the Gazeta News, of August 28th, 1949. The newspaper A Gazeta was the mother-cell of the current Fundação Casper Libero. It was founded by Adolfo Campos de Araujo, circulated for the first time on May 16th, 1906. A Gazeta surged with the republican spirit and the evening paper followed the formats of the newspaper of the 19th Century: few images and a lot of text. As usual in the time, amongst other things, there was a dedication to defend a political positioning and to deal with the economy, literature and culture. The first years of the newspaper were branded by financial crisis which featured a period of instability. After Adolfo´s death, in 1915, the publication was managed by his brother Jose Pedro Araujo who sold to the lawyer Joao Dente, being later on repassed to Antonio Augusto de Covello who again resold it, on July 14th, 1918 to the journalist Casper Libero – this one promoted reforms and innovations, starting through the diagram and a different graphic presentation – the first in colors in Brazil. In the hands of Casper, “A Gazeta” reached its golden period, between the decades of 1920 and 1950. That entrepreneurial journalist transformed his evening paper in the most modern newspaper in Latin America. “A Gazeta” would become the preferred newspaper of the Sao Paulo people and played a role of extreme importance in the defense of the democratic institutions, becoming, in 1932, the voice of the Constitutionalist Revolution, in Sao Paulo. Two years before, “A Gazeta” took the forefront of the Revolution of 1930 and the growing Constitutionalist Movement, therefore it was took over by the Getulio Vargas´ supporters still in that year. The revolted, besides burning the installations of the newspaper, destroyed the clock (the utmost symbol of the newspaper), which was located on the façade of the building. Casper Libero moved a legal motion against the Federal Government and, with the indemnity money, traveled to Germany and purchased the most modern, existing printing equipment. Casper also innovated to release a handbook dedicated to the sports (A Gazeta Esportiva – that in 1947 became a newspaper) and by creating the supplement A Gazeta Infantil, with texts for children and comic strips; “A Gazeta Magazine”, about literature, “A Gazeta in RotoGravura”, “A Gazeta Esportiva Ilustrada”, among others. It was the pioneer in the creation of many supplements. Casper still valued the local, regional, cultural, sport and social themes, in order to attract the attention of the readers. Subjects that were not approached by the Brazilian press, gained space in “A Gazeta”. The growth and the modernization of the newspaper stagnated with the death of Casper, in 1943. However “A Gazeta” still maintained itself as the pioneer until the decade of the 1950s, when the other newspapers promoted innovations. On the 25th of August, 1979, amidst a financial crisis, “A Gazeta” became a supplement of the newspaper “A Gazeta Esportiva” . However, 20 years later, the supplement was no longer published. 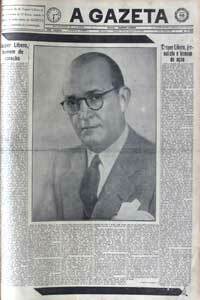 “A Gazeta”, along with its centennial trajectory, worked in search for the development of Sao Paulo and the country. With a strong nationalistic sense, the newspaper took the word “progress” as a key-word that summarizes its history. “A Gazeta”, 73 years as a publication, taught posterity how to transform journalism into a social weapon in favor of the country. The newspaper “A Gazeta” started with the republican spirit. When created, the paper followed the molds of the newspapers of the 19th Century: few images and pictures with a lot of text. As usual for the time, it was dedicated to, among other things, defend a political positioning and to deal with economy, literature and a little bit of culture. By assuming the command of “A Gazeta”, Casper Libero promoted a modernization program for Latin America. This initiative happened in three stages, which granted its notoriety, until the surprising death of Casper Libero. Between 1918 and 1928, developed the first phase of modernization of the newspaper, in which he started a process of reorganization and restructuring of the paper, which included the acquisition of machinery and the search for more adequate installations for the news office. However, this period was branded by financial crisis, once the newspaper was in debts and with low sales. The journalist achieved editorial changes valuing local, regional, cultural, sports and social themes which until then were not much publicized. Casper brings, therefore, subjects which were approached by the European and North-American media, since the 19th Century, to the Brazilian press. Through his articles about the city´s urbanization and its consequences, a link was created between the community and the newspaper. “Gazeta” started to publish one page, in each edition, aimed to the sports coverage in Brazil and the world. The interest of the readers for the subject stimulated Casper to publish the supplement A Gazeta Esportiva, which in the future – as a result from its success – would get away from the newspaper and become an independent newspaper. In love with sport, the journalist made “A Gazeta” , a broadcaster for this practice. To call attention of the readers, it conceded several sports competitions, such as the Sao Silvestre, the Nove de JulhoCycling Competition, the Small Fields Soccer National Competition and the Sao Paulo Swimming Crossing, with some of them still being disputed in the current days. Besides such events, Casper sponsored the beauty contest for Miss Beauty of Sao Paulo, which is previous to the Miss Brazil. In order to stimulate newspaper reading by all family members, Casper created A Página Feminina (The Female Page) and A Gazeta Infantil (Children´s Gazeta). In the publication aimed to women, the paper sought to unite themes about sewing, knitting, culinary and children with subjects dedicated to the modern women who worked and played sports. A Pagina Feminina (The Female Page) is the first section of female interest published by one of the largest newspapers at the time. The supplement A Gazeta Infantil (The Children Gazeta), which later was known as Gazetinha (Little Gazeta), presented charges and comic strips, besides material aimed to the children and youth audience, which was non-existent in the Brazilian press of that time. Years later, the supplement A Gazeta Juvenil (The Youth Gazeta) was created with the objective of publishing texts for the adolescents already used to reading. With the finances now in balance, A Gazeta started a new phase, in which Casper Libero prioritized reforms in the newspapers´installations and the investment in new and nmodern equipment. The second stage of the modernization started by the newspaper owner happened until the beginning of the decade of the 1940s. In order to enhance the modernization of A Gazeta, the technical office Ramos de Azevedo constructed, under the orientation of Casper, the first building which was specific to host a newspaper in Brazil. Located on Rua da Conceição, currently Casper Libero Avenue, the building with eight floors had archives, library, individual cabinet rooms for the publishers, press offices, auditorium with 300-people capacity and apartments for honored guests. Casper Libero took advantage of the modern structure to promote courses, speeches and the exhibition of films, in order to integrate the society to the communication vehicle. The third and last phase of modernization implemented by Casper Libero in A Gazeta which took place from 1940 to 1943, sought to divulge civic activities to the population. In speeches and debates, international celebrities, intelligent people and businessmen presented in the auditorium of the newspaper, which became a great cultural and political center of the country. To present the developed political-cultural debate, Casper created the supplement “A Gazeta Magazine”, in 1941. However, the great innovation brought by “A Gazeta” and adopted by the other newspapers of the time, was the organization of information and articles in editorials and supplements. Until these days, much of the modernization implemented by the newspaper from Sao Paulo are a source and an inspiration for the production of a good journalism. The growth and the modernization of the newspaper stagnated with Casper´s death, in 1943. 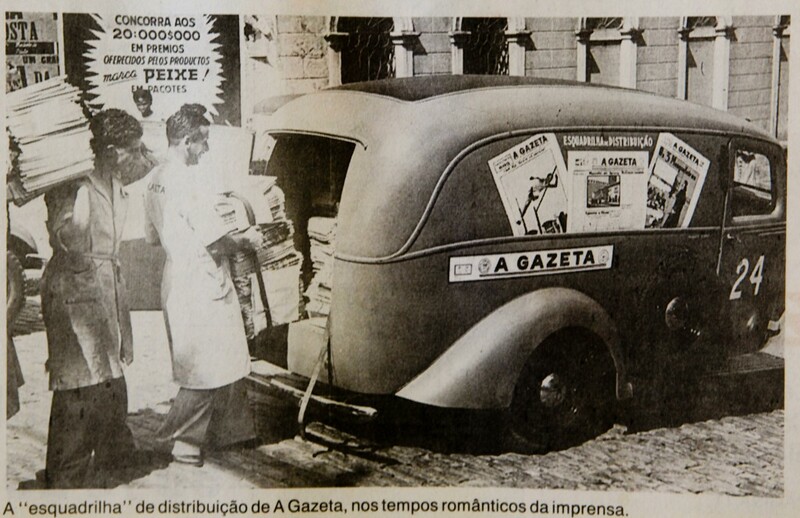 “A Gazeta” still maintained itself as a pioneer in journalism until the decade of the 1950s, when the other vehicles promoted modifications. The evolutions, since 1944, with the creation of the Fundação Casper Libero spread out each time a little more through its units. “A Gazeta Esportiva” became the first daily sports newspaper; the Gazeta AM Radio became a reference as an elite broadcaster dedicated to sports; the Casper Libero Faculdade (Casper Libero College) was the first national institution that taught journalism (and consequently, communications); TV Gazeta was pioneer of TV broadcasting in colors and the first to use Brazilian technology in digital TV; the Radio Gazeta FM was one of the first FMs in the country. The seed planted by Casper Libero and, in its turn, his “A Gazeta” creates innovations each new day, becoming a reference as one of the most respected Brazilian communication compounds. On the 16th of May, 1936, date of the 30th anniversary of A Gazeta, Casper Libero wrote the article partially represented in this page. Nowadays the message of the patriarch is more alive than never: the news in paper has changed, modernity took the company to invest in other media, but journalism continues to be the “fuel” that moves the Fundação Casper Libero. “A Gazeta” is older today. It is a very pleasant date for those who work in this house because it represents the affirmative of a collective victory. The publishing body, the administration and the offices, they all felt the same hope, suffered the same sadness, worked with the same flame in order to have the “A Gazeta” to reach the situation that is shown nowadays. A newspaper is not just a bundle of machines, from where out goes the expression of our thoughts, the clamor of our campaigns, the essence of our aspirations. The newspaper is a set of people, that either ill or in health, working under the same roof, with the same ideal and under the same flag, achieve with religious faith, every day, without rest, come rain or shine, hot or cold weather, an efficient effort, only with the objective of projecting the newspaper to the future. It is not purposeless to state my impressions as director. The victory of “A Gazeta” reflects, before everything, the spirit of our race. It is in this, in my wishes, in your sufferings, or in your moments of pleasure that we will seek to find emotions to transform in a purpose and a program. It is necessary to know that the newspaper must be the reflex of its city and not the city the reflex of the newspaper. A newspaper does not have friends; it has rules. It must not claim rights only because it has rights. And it was because we had traced this route in our professional life that the people of Sao Paulo always waited from Gazeta the manifestation of a great professional honesty and a great spirit of justice. The situation of prestige in which Gazeta was put, either in São Paulo and throughout Brazil, is a reflex of the unanimous sympathy towards our rules and the approval for everything we have done. And therefore we will go on through time with the Gazeta. Other directors will come, but one thing can be said with the utmost certainty: today and always the Gazeta will have its own orientation. It may make mistakes, but its mistakes will be reflex from its convictions and from its honesty.